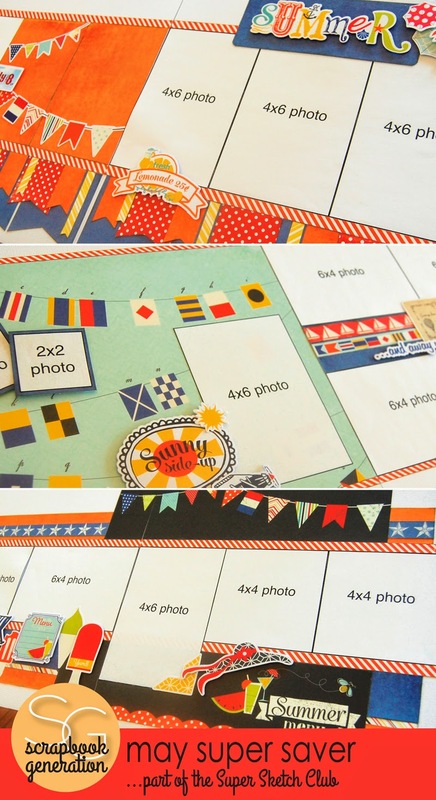 Instead of our regular Saturday sessions, because of our National Scrapbooking Day celebration the Super-Saver Scrapbooking layouts for May are only available as kits. Yes, materials for these three layouts will be included in your May kit! • The best deal for our long-distance customers! Get this kit, the Sketch Day One layout kit, and the Sketch Day Two layout kit (includes materials and sketches for five double-page layouts, plus two bonus double-page sketches -- a $24 value) for $20 plus $6.99 shipping. Order a kit or join the Super Sketch Club. Hit the NSD jackpot with SG! April issue of Create is live! New at SG's Springfield store! April's Sketch Day One layouts! New! Bank It with SG! New collections (and more) at SG! April Super-Savers...and big weekend plans.